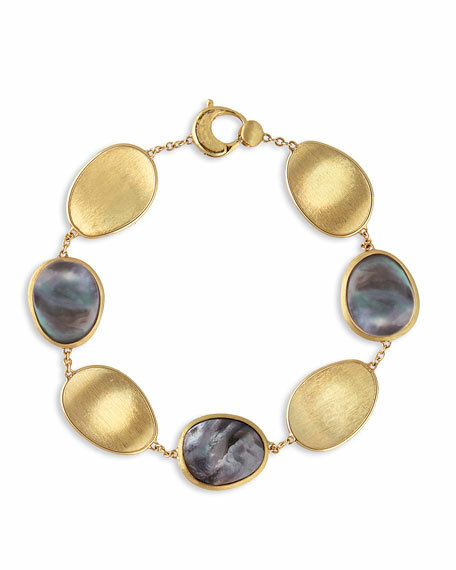 Marco Bicego bracelet from the Lunaria Collection. Bezel-set, smooth black mother-of-pearl stations. Alexis Bittar wide hinged bracelet. Golden and rhodium-tone plating. Hand-sculpted, hand-painted Lucite®. Crystal with natural malachite doublet. White cubic zirconia and pyrite. Clear crystals in paisley studs. Hinged opening eases dress. Approx. 3"W; 0.7"H. Made in USA.